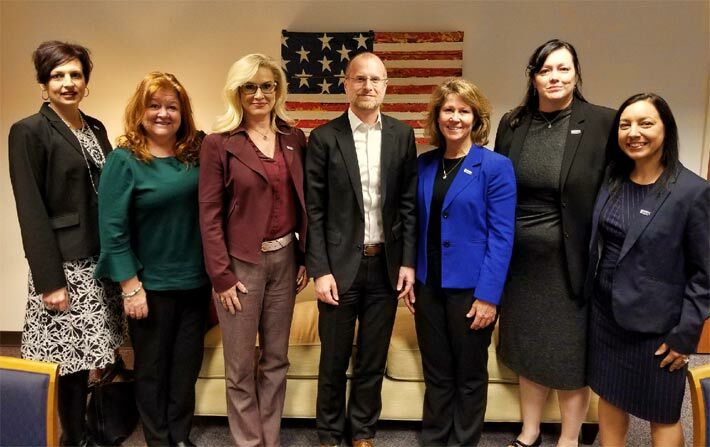 Women of NATE (WON) representatives recently met with FCC Commissioner Brendan Carr and FCC Policy Advisor Evan Swartztrauber at the FCC Headquarters in Washington, DC to exchange views on key industry topics. Commissioner Carr visited with members of WON, Andy Lee, Vice President of Operations, Lee Antenna & Line Service, Inc.; Miranda Allen, CEO, Radiofrequency Safety International; Shama Ray, CEO and Owner, Above All Tower Climbing, LLC; Therese O’Brien, National Account Executive, Tessco Technologies; Heather Gastelum, Sr. Manager, National Tower Safety & Operations, T-Mobile; and Paula Nurnberg, Chief Operating Officer, National Association of Tower Erectors (NATE). 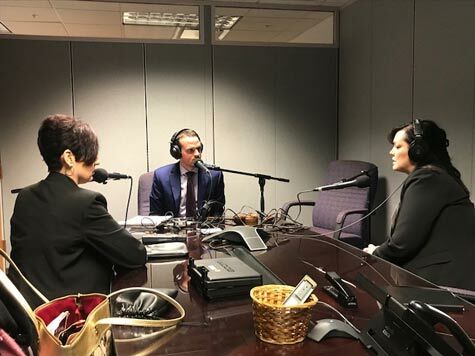 Pictured during an FCC podcast interview are Miranda Allen of Radiofrequency Safety International, left, and Andy Lee, Chairwoman of Women of NATE. The topics of discussion included broadening nationwide telecom career path opportunities, workforce development and training, growth of women in technology, and the opportunities afforded, therein. Carr was also provided with first-hand accounts of women in the telecommunications industry. The mission of the WON program is to foster an exchange of ideas, expertise, and camaraderie among the National Association of Tower Erectors . To learn more about WON and their various programs, visit the NATE website, www.natehome.com.